Our debate over gun regulation dances around the obvious: The fears and assumptions of a previous century reach into ours, groping like an alien’s fingers until they find us and strangle us. The unwritten rules of quasi-religious nationalism — as opposed to simple patriotism — muddle genuine discourse. Ironically, we fail to appreciate the Constitution for what it really is: A remarkable human document forged in compromise at the world’s edge and wrapped in 18th-century anxieties. Neither James Madison nor Alexander Hamilton thought they were writing new Scriptures, nor would they question the loyalty of 21st-century Americans suggesting re-writes of the grammatically dubious amendment (read the version passed by Congress: “A well regulated Militia, being necessary to the security of a free State, the right of the people to keep and bear Arms, shall not be infringed”). Add it up: The Second Amendment hearkens to 17th-century British fears coupled with ancient worries over a tyrant’s standing army. The Red Coats march on Lexington and Concord didn’t help. Anxieties over despotism framed the unworkable Articles of Confederation, so delegates were dispatched to Philadelphia to modify them. 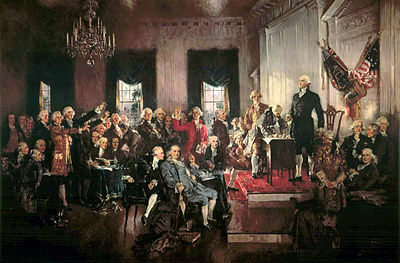 They scrapped the Articles and wrote our Constitution without asking for permission (memo from the nitpickers committee: Was the Constitutional Convention legal?). The Bill of Rights came later, partly as a concession to states guarding their near-nation status and wary of the federal power to raise an army. James Madison assured skeptics in the Federalist Papers that state militias could defend themselves against national troops, unwittingly supplying intellectual fodder for the South in the Civil War. It’s all so foreign, so distant, so other-worldly, so … alien. The gap between us and the founders yawns: The United States “were” (not “was”) 13 rural, loose-knit semi-countries of 3.9 million on the rim of a vast, unmapped wilderness. New York City’s population was 33,000; Philadelphia’s, 28,522; Boston’s, 18,320. Life expectancy at birth in 1789 was 34.5 years for males and 36.5 years for women. Physicians bled and purged their patients to balance the “humors.” The indigenous peoples were “naked savages” and African Americans were three-fifths human (it’s strongly implied in our supposedly sacred Constitution: Article One, Section 2, Paragraph 3). Feel the choking fingers. Seventeen of the 39 Constitutional signatories kept slaves. Underscore that in bold: They owned people. An unremarkable white male like me could purchase Colin Powell. Thomas Jefferson halts Martin Luther King between his I-have-a-dreams to check his teeth. Maybe he’ll buy him (buy him!) along with Coretta so they’ll serve as Monticello “house hands,” expecting thanks because their charitable, enlightened — and guilt-riddled — master did not tear them apart. Get this alien off-a me! Legal scholars mumble something about the National Guard functioning as the modern militia. Some even keep a straight face. No matter: everyone knows our modern military would never march on Lexington and steal its arms caches. A drone would fire a smart bomb (so much for those private stocks of semi-automatic weapons). More to the point: the nation’s officer corps is drilled with an ethos of civilian control and democratic values. I doubt our secretary of defense and joint chiefs would obey orders compelling them to play the villains in overthrowing the world’s most influential democracy, which they’re sworn to protect. It could happen, of course — anything could happen — but America’s 21st-century fears center around mad men in malls, movie theaters and schools, not “papist” rebels and General Cornwallis. The Mother Country has seen this and, while acknowledging the spirit of her Bill of Rights, implements stricter gun regulations. Should we re-write the Second Amendment and, at least, smooth its grammar? Perhaps not. Fire-breathing, nationalist demagogues would issue panic-stricken cries of heresy and treason – despite the Constitutional provision for amendments. That’s tragic, because recent events underscore how we need reasoned, dispassionate debate. The fog must lift and we must pry away those alien fingers. Our founders were not apostles; they were sweating people with clashing intentions, fretting about their newborn country and Philadelphia’s occasional outbreaks of yellow fever. Their document — admirable as it was — was not holy writ.